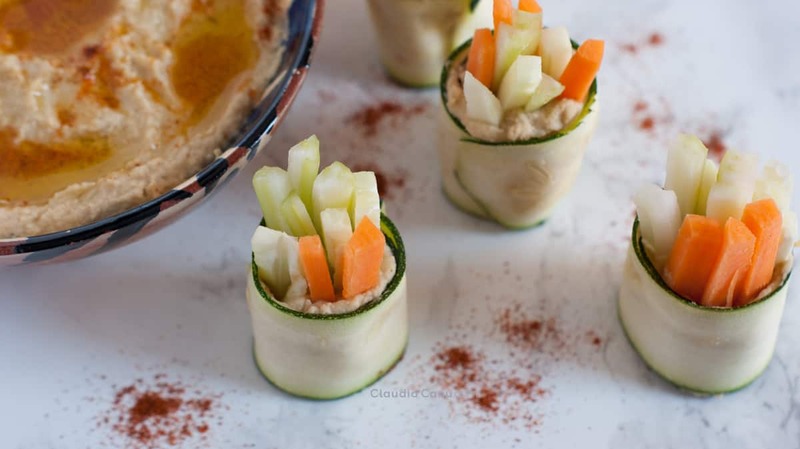 Zucchini roll ups with hummus and veggies. A healthy snack! 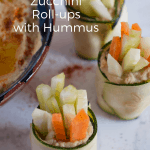 These zucchini roll ups are the best way for you to eat more veggies, especially if there are some that you usually don’t eat because you don’t like the taste. It’s an easy recipe to make: it’s vegan, paleo, gluten-free and dairy-free, plus, you can change the flavors as you wish and they are perfect for your Healthy Meal Planning. 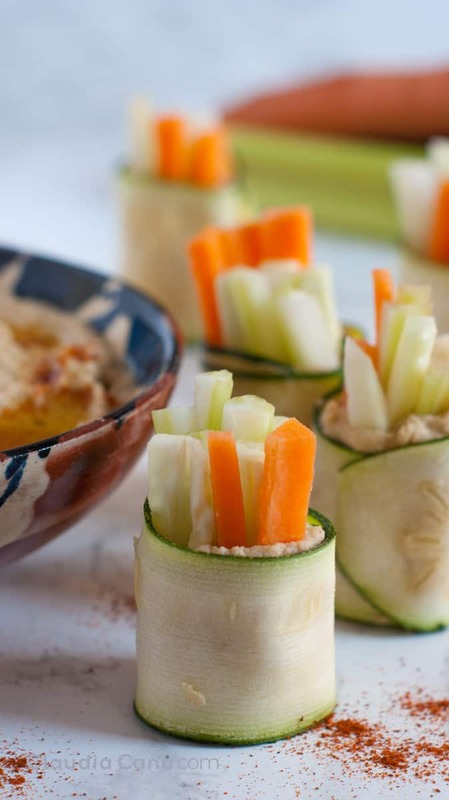 Cut carrots, celery and cucumber (or the veggies you prefer) in thin sticks about 4 cm (1,5 inches) long. Slice the zucchini with the help of a peeler. Spread the hummus (or spread of your choice) along the zucchini slice. Place the veggies sticks on the left side of the zucchini slice. Roll the zucchini from the left side. As you can see in the video below, the way to prepare zucchini roll ups is very easy, although the preparation will probably take you longer than you expect. In fact, you don’t need any special skills to prepare these zucchini roll ups but only some patience to cut the vegetables in the right way. To slice the zucchini you can use a simple potato peeler or any other utensil you have in your kitchen to make really thin slices so that you can roll them without breaking them. Keep in mind that when you are slicing the zucchini, it’ll become slippery and sticky, so be careful not to injure yourself with the peeler. Are they cheap to make? You only need 5 ingredients for this recipe and the price will vary depending on how expensive the vegetables are. If I decide to buy organic veggies, the price is about 2 or 3 times what I pay in a normal produce market, but at least I guarantee that most of the veggies are local products. Also, the price will depend on the veggies you decide to use and if they are in season, which would always be the smart choice. Also, the hummus or the spread that you are going to use might be more expensive if you buy rather than make it yourself. When shall I prepare these zucchini roll ups? I usually eat more raw veggies in summer than in winter, which means that I prepare this version of roll ups mostly when the weather is warm. The reason I do so is that in the last years I have been living in a cold flat in Barcelona, so in winter I’m in need of warm food. What I’d like to say is that this recipe is perfect any season of the year. How to store these raw zucchini roll ups? Freshly cut veggies oxidate quickly and it’s recommended to eat them the same day. However, in my experience, I have seen that if you store the zucchini rolls in an airtight container, they will keep their freshness and crunchiness for the day after. Can you bring these zucchini roll ups to work or to a picnic? You sure can! Try to store them vertically and keep them tight to make sure they will survive the journey. 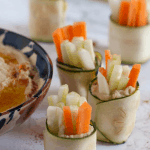 You can also bring some extra hummus (or your favorite spread) in another container so that you can dip your zucchini rolls for an extra flavor. If you are looking for a healthy original recipe to add to your homemade brunch, this is just perfect, especially if you are hosting -or if you have been invited to- an all-you-can-eat brunch buffet. They will surely add some color to the buffet and it is an original way to present raw veggies. A BBQ is also a perfect occasion to eat them since it’s always recommended to eat extra veggies to go with your meat. Plus, you don’t need a plate or cutlery to eat them, so everyone can just dig in while standing and talking to each other while waiting for the meat to be ready. There are no restrictions on how and when to eat these roll ups. Do you crave raw veggies for breakfast? Go for it! What about dinner? I’d say why not? When I shot the video-recipe, for example, it was around 2 pm and I was starving when I finished, so they were just the perfect lunch and went straight into my belly even before I could grab a plate. Can I make them with other ingredients? Yes! 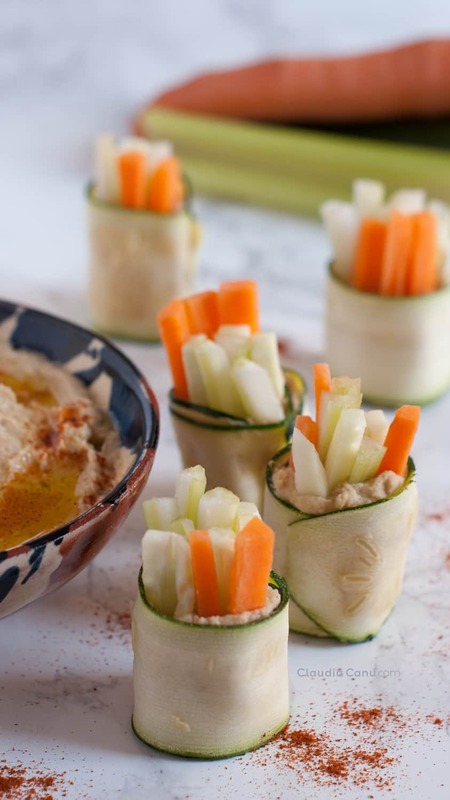 You can use the vegetables you prefer or, as already mentioned, the ones that are in season at the moment you are going to prepare the roll ups. The zucchini can be substituted with cucumber or cooked aubergine (eggplant). The veggies sticks could also be pepper, fennel or some leaves. As a spread, you can use hummus (any type of it) or if you eat cheese, you can also use some cream cheese. In fact, you could use any savoury spread you prefer because I’m sure that the combination with raw veggies will be just great. There are many people, for example, who prefer zucchini roll ups with ricotta. 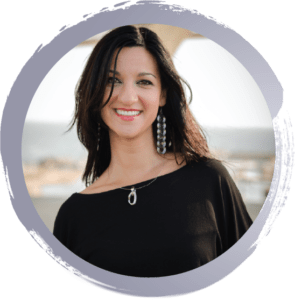 I’ll confess that I do like to use hummus because I also make the hummus myself and I love to know that I’m eating 100% natural ingredients without any preservatives. Anyway, there are really no limits to the imagination for these veggies roll ups, it’ll just depend on everyone’s preference on taste, or access to produces. Can zucchini be eaten raw? This might be a strange question for you, but, believe me, for some people it’s not. At least it wasn’t for me. Up to a couple of years ago, I wouldn’t have eaten raw zucchini because in my family nobody used to eat raw zucchini. So, I grew up eating a lot of zucchini, but always cooked or baked. One of my favorite recipes growing up was stuffed zucchini and I used to help my mother prepare them the day before. We used to cut the zucchini in about 1,5 inches long and we would hollow them out leaving the skin and the base as if they were little zucchini glasses. My mum would then cook the filling with minced meat mixed with the part of the zucchini we had just removed. We would then fry the little zucchini glasses and let everything rest. The day after we would stuff the zucchini with the filling, sprinkle them with parmesan cheese and then bake them. My mouth begins to water just thinking of it. A few years ago, however, when I had more opportunities to meet people from other cultures, someone brought raw zucchini with hummus to a picnic. At first, I was really surprised and thought that it couldn’t taste good until I tried it and the taste was much better than I expected. Indeed, zucchini can be eaten raw and if you just look online, you’ll find many raw zucchini salad recipes. Can you eat the zucchini skin? Since we have already explained that zucchini can be eaten raw, it’s also good to explain that we can indeed eat the zucchini skin. Although, like any other fruit or veggie that you want to eat with its skin, it is highly recommended to buy it organic since the pesticides accumulate mostly on the skin. Are raw veggies more beneficial than cooked ones? How many times have you heard that if you cook your veggies you’ll lose vitamins and minerals? Yes, that’s a common information that we all have received. However, there are studies that show that some vegetables increase their nutritional value when cooked. For example, tomatoes increase their antioxidant activity and carrots increase their level of beta-carotene. It’s not as simple to compare the healthfulness of raw and cooked food and scientists still need to study many of the mysteries on how the molecules in plants interact with the human body. What we do know for sure is that eating fruits and vegetables is important in everyone’s diet and if you eat it raw or cooked will still be a good choice. 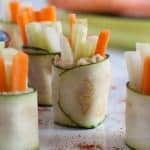 If you are a picky eater and there are vegetables that you don’t like, these zucchini roll-ups are just perfect because the taste of the veggies will be mixed together. Plus, the hummus has a quite strong flavor that somehow covers up the veggie flavors. I used to avoid cucumber, spinach, celery, cauliflower and many more veggies for the first 39 years of my life. I never missed them and I wasn’t aware of how important they are in our diet. 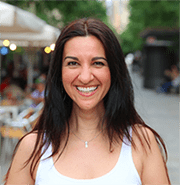 However, since I began my challenge and the Master program in Nutrition, fruits and vegetables have become essential in my diet, and I do the best I can to eat a variety of vegetables. Of course, it hasn’t been easy to change my habits and desire for certain unhealthy foods. At the moment I do prefer the taste and the crunchiness of raw veggies, probably because I still have in mind the memories of when my mum tried to force me to eat boiled veggies and I always refused it, especially if they were green. I know this is just an image that has been stuck in my head that I could possibly change. In fact, this is one of my goals in regards to my personal nutrition and making this kind of recipe is actually helping me to do so. This is not a process that I can change in a few days, but I also know that if I set a goal, I will only accomplish it if I work on it and if I am willing to take every step in the process that will lead to eventually enjoying every single vegetable. How many veggies do you usually eat? Do you prefer your veggies raw, steamed or boiled? When do you see yourself eating these zucchini roll ups? 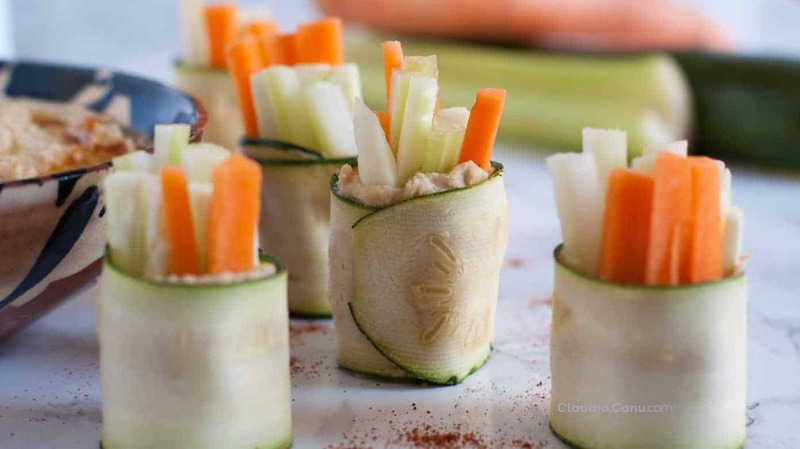 You can make them with different veggies and/or spread. I give you more ideas in the text. These zucchini rolls look absolutely delicious and I love that they are so colorful! I bet I can make my children eat more veggies with them. Thank you so much for sharing this recipe!